Hey gang. London party institution Rockit Science has just turned the grand old age of 5 (quite an achievement in this day and age, as 5 club years is equal to about 50 in human years), so they’re celebrating by throwing the mother of all birthday bashes this Saturday at the Lockside Lounge in Camden. 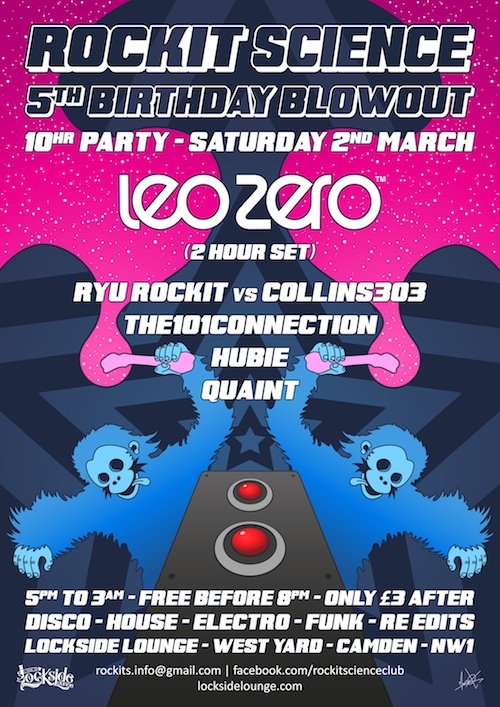 The party is being headlined by disco mash-up maestro Leo Zero with a cracking supporting cast made up of The101Connection, Quaint, Collins303, Ryu Rockit and some bloke called Hubie. Expect to hear plenty of disco, funk, electro and general party bangers to keep you partying ’til the wee small hours. This entry was posted on 28 February, 2013 at 12:44 pm and is filed under clubbing. You can follow any responses to this entry through the RSS 2.0 feed. Responses are currently closed, but you can trackback from your own site.